Instead of the South Station expansion, build a new smaller terminal station in the seaport using track 51. Route the Greenbush, Kingston, and Middleborough lines to this new station. Downtown bound passengers could just get off at JFK/UMass and switch to the red line. Alternatively red line passengers could get off at JFK UMass and switch to a seaport bound train. An ideal spot for the new station would be behind the PWC building. But a more likely spot would be next to or under the convention center. Double tracking the lines might require the South Boston bypass road to be taken. However I think that's a decent compromise for better transit. This would also set up space for increased service on the other lines that will continue to go to South Station. As an alternative you could get rid of the bypass, route the Fairmount line to track 51. You could even upgrade the line to rapid transit via electrification and smaller vehicles. That would do absolutely nothing except worsen the whole of the South Shore's access to downtown, tank their service levels because such a constrained routing can't handle the schedules or equipment rotations, and punish those riders with more hoops to jump through to get to other critical services like Amtrak, intercity buses, and local buses. Transferring on a crowded JFK platform is no substitute. Now, if you want to get a sense of how much a nonstarter this is going to be...watch the fur fly when the 'till-now secret South Coast Rail Middleboro Alternative traffic modeling gets unveiled and ends up gapping the hell out of South Shore headways. Several towns are already ready to sue over that...and that damage to service from SCR projects relatively mild compared to the disruption of shearing them off to some Amshack of a terminal out by the Convention Center. Prior to 1900 the 4 individual southside RR's--Boston & Providence, Boston & Albany, New York & New England, and Old Colony--all did have their own single-purpose separate terminals scattered about Back Bay/South End, the Seaport, and Ft. Point. The whole point of that quartet banding together to build South Union Station was location! location! location! and convenience. SS was at the crossroads of multiple neighborhoods and had superior intermodal transfer access to any site south of the old downtown. And the same is true today, even with the blocking presence of USPS cutting the Dot Ave. gateway to Southie from general traffic. There is literally no better place to run the trains. Fairmount to Track 61 was already proposed by some BCEC flaks, and already violently opposed by Dorchester and Hyde Park commuters who would've lost many times more access than gained. Nonstarter for them, too. Amtrak had not yet weighed in on publicly on that proposal, but they were very likely to say nein to any service that crossed over their access to Southampton Yard. Conceptually kookier thru-routes to Track 61 have also been thrown around. The overwhelming conclusion is that one-seat commuter rail trips to the Seaport are NOT desired by any known segment of the suburban population. Southside CR riders also aren't the biggest critics of the Silver Line's problems, either, because that's generally not the crowd that's being passed like a kidney stone through both over-congested sides of the Red-Silver transfer...they're just going right downstairs to Silver. What needs to be done is pull the unrelated cogs of SSX apart into separate projects...because too many chefs are stirring the pot with pieces that serve different masters. The bare platform construction and switch layout fixes for traffic conflicts are not all that controversial on their face. It's a major capacity expansion that also does more rapidly-turning RER ops a real solid by eliminating the cross-cutting movements that keep trainsets bottled up on the platforms. The switch fixes allow platform lengthenings so every berth can take on a crush-load crowd. That's all fixing a glitch induced by lopping the formerly symmetrical station in half in the late-1960's. It doesn't require anything more than fixed-cost rail engineering, and platform pours that have the requisite metal awnings. Track work did not cause SSX to sail to nearly a billion dollars or become an existential crisis for the Commonwealth. The real estate interests are what ended up confusing this project to a mess. The real estate empire-building, bejeweled headhouses and expanded waiting rooms, grand reimaging of Dot Ave., recreational use of Ft. Point Channel, and all the other form-over-function stuff is somebody else's problem to fund. It doesn't impact the transportation essentials. All the transpo-centric base build has to do is get USPS moved, do its fixed-cost track/platform construction, and fashion air rights peg mounts between tracks exactly like the main station's 1989 renovation did for future uses that took 30 years to materialize. Shear all the empire-building nonessentials off for others to figure out. It might actually do the land-use planning some genuine good in the end to narrow and bottom-line its focus so it's not such a confused lump of conflicting interests. As for Track 61...it's overrated in general for transit because it whiffs on any/all connecting transit starting in the Southampton/Widett wasteland, missing Broadway + Andrew at the midpoint, running on the wrong side of the Pike for a direct transfer to Silver, and failing to catch the 9 or 11 buses deep down in the very constrained pit. For no reason other than it happens to pass in front of BCEC it's become this shiny bauble of "potential" that officials and deep-pocketed investors think must be exploited...yet no one's ever been able to fashion a coherent transit best-practices argument (bread-and-butter stuff like frequencies, transfer utility, accessibility) for the various schemes floated about. At this point it's not that people haven't thought hard enough for an angle; if anything they've thought TOO hard. It's just a square-peg line to try to fashion anything out of...and being the first to push extremely hard enough to wedge the square through the round hole isn't going to suddenly make it good transit. Nor is getting rid of Haul Road and sacking Southie with a daily truckopalypse for their troubles. I posted this in the Bayside thread too. What about a "starter" streetcar line that starts at South Station and runs on Summer Street all the way to L Street. It continues on L Street to William J. Blvd, where it continues to Bayside Development and JFK Redline Station. This could be a single line that hits HUGE commercial development in the Seaport, area around Drydock Avenue, Cruise Terminal, South Boston Powerplant redevelopment, South Boston residential heart, plus Bayside growth. Additional lines could be added down Broadway to service the commercial and retail heart of South Boston. Am I crazy to think Boston could fund this and NOT MBTA? I don't think you're getting a streetcar that runs on Southie neighborhood streets ever. Maybe a converted/dual-mode transitway tunnel from SS to BCEC/WTC, tunnel under D-Street and emerge to run a streetcar along Summer (or the new Haul Road) to City Point. It would be peripheral to the neighborhood but could funnel passengers from the bus network between Broadway and Andrew in the west and City Point in the east. Maybe even branch it out of the Transitway and have another stub that runs down to the west of the Reserve Channel and ends at First Street. I think it would be politically unpalatable to blast a streetcar through Southie and reach points in Dorchester. The southside could be well-handled by BRT, especially if that's how the southern loop of an Urban Ring is completed someday. Get the Green Line to the Transitway first and we'll talk. 9 City Point (more or less today's 9 bus) was a busy Green Line branch off the Pleasant St. portal until its bustitution in Dec. 1953. CP is always a possibility since the 9 is perpetually overloaded. Pluses in favor of streetcar off Silver Line Way is that the Summer St. bridge is wide enough to re-stripe and put the trolleys to the left of the yellow stripe for complete traffic separation (if not physical separation). That means there would only have to be at most about 3/4 mile of actual mixed traffic street-running to reach Marine Park. Minuses would be that the former Silver Line routing down E. 1st didn't do so hot on ridership the last time around so you probably have to do battle with traffic-heavier E. Broadway instead; demand seems to glom much more closely to the literal 9 route instead of 'close enough' parallel streets. Also can't go totally streetcar-mad off Silver Line Way with a whole Southie-crawling network of tracks because there'll be too much co-mingled bus & trolley traffic running through there. Too many branches of each mode will start to gum up the works more than bringing in high-capacity LRT can help clean it up. Keep in mind that southeast-quadrant Urban Ring may be a critical future addition to the traffic mix. So for new trolleys entering city streets after getting Green as far as SL Way you may be limited to just the drop-in replacement for SL2 (hopefully with some modest street reconfig for better traffic separation) and a go/no-go option on whether to do a poke to City Point. Combined with the new payment systems and surface stops at North Station, Haymarket, Aquarium/Faneuil Hall, and Rowes Wharf, you solve the North Station connection and also provide connectivity to the Seaport via a single transfer (or less) from all branches of the network. 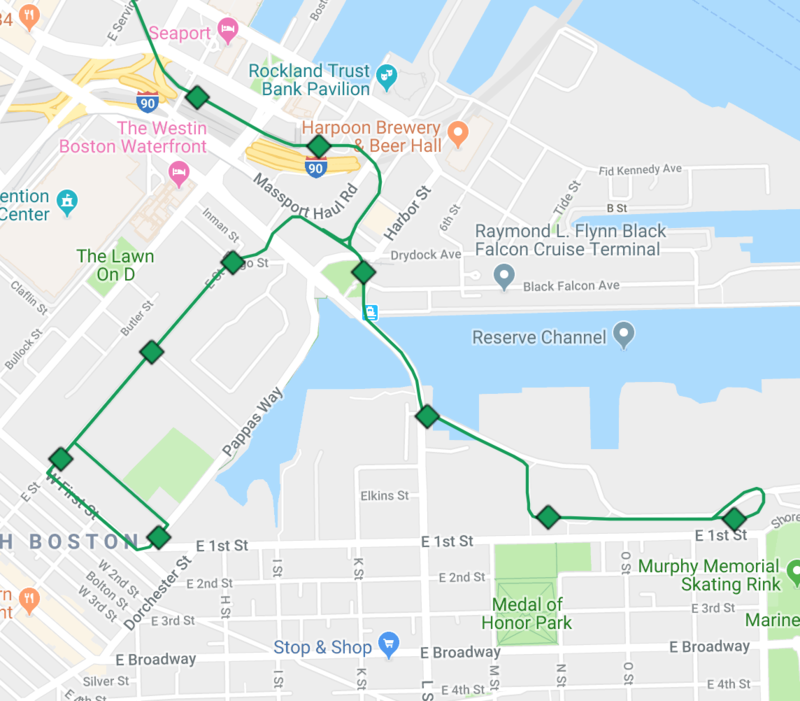 A bus connection to Logan via the Ted Williams Tunnel could be offered from the Seaport terminus of the line as the Blue Line connection and APM would easily accommodate the bulk of airport traffic. Have the line continue down N. Washington instead of turning on New Chardon/Canal, run along a redesigned Rutherford Ave, across the Alford St. Bridge by the Casino, Down Broadway in Everett where it'll reconnect to the rail ROW and run east before connecting to the current SL ROW in Chelsea and complete that route. Problem: because of all the Big Dig ramps there is only one way out of the Transitway: west under Essex St. to the tip of Chinatown Park / a.k.a. plaza in front of the Radian. That is the point where you are clear of the Purchase St. entrance ramp to 93S. From there you only have room to incline-up to a surface portal by traveling south a block to Beach St., which ends up being a screwy way to try to get around to the Seaport. Turning north instead is a no-go because of the Purchase ramp, the State Street building, and the too-sharp-for-any-vehicle 45-degree turn required to get clear underneath Lincoln St. Green. And even if you could get there the incline room isn't enough to clear the Red Line tunnel at Summer St.
Basically, any scheme for linking with the Transitway is "locked" no-budge into that Essex-to-Chinatown Park block. Everything south and west of that plaza tip in front of the Radian is fungible for a routing, but nothing whatsoever north or east will work because of blocking structures meeting bad angles. If the Boylston hook-in and Chinatown underpinning get too tortured going all the way under Essex in a light rail retry of the Silver Line Phase III tunnel (and it most certainly will be too hard), then it's a pick 'em of some length of reactivated Tremont St. tracks to. . .
. . .Marginal Rd. + Hudson St. + Chinatown Park. . .
. . .Oak St. + Hudson St. + Chinatown Park. . .
. . .Stuart/Kneeland St.'s + Chinatown Park. . .
. . .LaGrange/Beach St.'s (veeeery dodgy) + Chinatown Park. . .
. . .to that connecting block of Essex between Chinatown Park and Atlantic. Marginal is the only one of those options that offers an opportunity for a surface portal (Tremont @ Marginal traffic island...same place SL Phase III was going to portal-up). If you really wanted a Greenway trolley, unfortunately a trajectory out of the Transitway just isn't going to work. That's more a job for unsealing the Haymarket portal and starting the surface journey on New Chardon heading south. I'm not sure a surface trolley is truly necessary if you're willing to do the badly-needed job of building that Green Line-Transitway tunnel connector, because you'd be able to go North Station<->Boylston<->South Station<->SL Way on one seat in that tunnel. But Greenway trolley via Haymarket portal most definitely is feasible. At that point: why not a tunnel connecting Boylston to South Station and the Transitway? I know the tunnel under Essex Street is supposed to be crazy complicated and expensive, but given the complexity and new track mileage of this proposal, I’d imagine the Essex Street tunnel would be both cheaper and more effective at solving this problem. Depending on the junction at Boylston, you’d be able to mix service patterns to/from the Seport: College Ave - Seaport, Union Square - Seaport, North Station - Seaport, Government Center - Seaport, Park St - Seaport, Riverside - Seaport, Cleveland Circle - Seaport, BC - Seaport, etc. If you want to minimize cost, these are the things that most address what cost issues killed SL Phase III. . . Avoiding structural underpinning of existing infrastructure. No stacked stations like Chinatown Under & Boylston Under. Avoiding as much Old Boston infrastructure as possible and ID'ing Urban Renewal land that got cleanroomed, well-documented utilities in the last 50+ years. For example, upper Essex is narrow, a utility minefield for cut-and-cover, and has structural impact uncertainties around some of its oldest buildings. The area around Tufts Med Ctr. to the Pike was all a mid-60's nuke zone. Re-use of as much present/future infrastructure as possible. That means using the outer Boylston platforms instead of building a completely different level, and using as much of the abandoned tunnel as possible. That means provisioning for future later-build uses of the reanimated 4-track tunnel for additional value recapture such as: converting SL-Dudley to streetcar, or re-routing the E off of Copley Jct. through Back Bay Station via Boylston. Routings-wise you're probably locked into NS/GC/Park southbound because that's where Boylston points, and not having any direct service from the Kenmore direction (though you can reanimate the filled-in ped underpasses at Boylston for switching sides). However any northbound branches and both Urban Ring NW & NE quadrants could get pair-matched, and if the E is re-routed off Copley Jct. that would probably take up Tracks 3 & 4 of the reanimated tunnel (plus remember that Urban Ring NW is going to wrap into Kenmore). Full Tremont St. tunnel reactivation. Tufts Medical Ctr. 4-track (2 IB-OB islands) station straddling Eliot Norton Park w/ mezzanine walkway to Orange Line level down street. Continue 4-track tunnel down Tremont to traffic island (where SL Phase III was to portal-up). Provision tunnel for westbound track split for future E relocation + future E-to-Seaport wye track (just a tunnel notch for now). Tremont better than Oak for digging because of width, easier maneuvering around Orange Line. Turn east under Marginal Rd. Sideways digging access available through Pike retaining wall w/ lane closures to speed construction. Shortly after turning under Marginal notch tunnel wall for at-grade track split of Washington St. light rail (complete as/when needed). Washington split--when built--would cross under Pike/NEC and portal-up on Herald St. retaining wall. Pass under Orange Line @ Shawmut Ave. (clean 75-degree angle). Turn up Hudson St., proceed to Beach. Street maintains 50 ft. width despite One Greenway building construction because of street-facing plaza space. No unusually difficult structures except for Chinatown restaurants row @ Kneeland (though those already got a cut-and-cover job on the other side for the 93 ramps, so probably no issues). Proceed under Chinatown Park to corner of Essex, turn into pre-reserved fill for SL Phase III tunnel. As in last post, if you don't want to go all the way to the Pike you can try cutting down earlier side streets...albeit at increased cost and less infrastructure re-use of the Tremont tunnel. Anything SOUTH or WEST of the tip of Chinatown Park is theoretically feasible, just not EAST or NORTH. This one above is just the one that keeps all the Old Boston impacts and stacking impacts to a minimum while allowing the most pre-build cost savings for additional service appendages later. Frankly, whatever gets it built soonest is worth doing whether it's direct-as-crow-flies or requires a South End jog to keep the $B's from bloating. By this metric, wouldn't surface routing along Marginal and Hudson be most desirable? Portal around Chinatown Gate. Take parking and one lane of traffic from the south side of Marginal. Close Hudson to automobile traffic. That would be quicker and cheaper with less tunneling, right? Not really when those blocks are going to be the cheapest digs by tunneling feet being in the urban renewal zone, and inclines are comparably more expensive by tunneling feet. Not to mention the inclines and surface jog are going to be a speed clog significantly lengthening travel times. You're better off just doing it all high-capacity in the tunnel. Marginal/Hudson doesn't bloat the cost all that much. And, remember: you can route the Urban Ring, Medford + Union/Porter, and an alt-routed relocated E to the Seaport so the value recapture increases exponentially over time by building it complete. I don't know where you put the northern portal in that scenario. It would need to be SOUTH of Chinatown Gate because there's no way for a streetcar to get from Chinatown Park to Hudson St without blowing up the gate itself. So the portal would have to be ON Hudson in front of a bunch of restaurants... Seems like a no-go to me, and the further south/west the portal needs to go, the less cost saving you get. In fact you might end up with cost BLOAT by adding two unnecessary portals for a short surface-run rather than just tunneling the whole way. Send the Blue Line down Storrow using a cut and cover. Continue to BU when you could have it switch over using the Grand Junction to the Worcester Line. Have Transfer Spots at Boston Landing and West Station. Leave the Worcester Line either through a Bridge or Tunnel to the other side of the Pike. Extend from there out to Watertown and Waltham. Why would you build a subway that actively avoids where people want to go? That isn't saving money, it's wasting money. Wouldn't that pretty much take up the row/GJ so the urban ring would be pretty much DOA from Lechmere/Kendall/etc? Yeah. IF Blue is going to go west along the river it needs to hit Kenmore. And probably terminate there. Ultimately the extension would serve as a release valve for the Green Line and Government Center. Sounds like Ty meant for it to take over the GJ *west* of the BU Bridge. So the potential Green Line branch to Harvard would be axed, but not necessarily the Cambridge portion of the GJ. Too Crazy: Drain and Dam Fort Point Channel and move USPS into where the Channel is now. Maybe put office space above the USPS to help defray the cost. Do whatever you want with the vacated spot.